As an associate to the firm, Jamel Rowe brings a fresh perspective to domestic relations issues. Jamel joined Hottell Family Law Group with several years of valuable legal experience in private family law litigation practice. She has devoted her career to family law and spearheads the adoption department at HFLG. 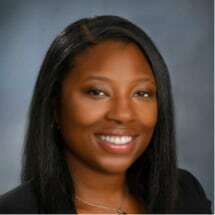 Jamel advocates for her clients on a broad range of family law issues including the negotiation of pre- and post-nuptial agreements and litigation of custody, support, and divorce disputes. She works one-on-one with clients in emotionally-charged situations to ensure the best outcome for them. Jamel has argued cases in various Northern Virginia jurisdictions including Fairfax, Loudoun, Arlington and Alexandria. After graduating from William & Mary Law School, Jamel received a one-year legal fellowship with the National Council For Adoption (NCFA) where she drafted two amici briefs for the U.S. Supreme Court case Adoptive Couple v. Baby Girl which debated whether a child who was 1.2% Cherokee could be removed from her adoptive parents to a biological father who attempted to relinquish his parental rights and had no previous contact with the child. She has also published multiple articles on adoption for national adoption magazines and for NCFA's monthly publication. Drawing on her experience and extensive network of adoption professionals, Jamel will aid adoptive parents as they open their hearts and their home to a child in need of a loving, permanent family. Although Jamel is originally from Easton, Pennsylvania she has called Virginia home since 2003. In her spare time, she reads and travels both nationally and internationally.